My friend Devon and I have this hilariously awesome Christmas present tradition in which we insist on buying each other some sort of kitchen or food related gift. It started off as ridiculous kitchen gadgets. She's gotten me things like a cake tester (aka metal toothpick) or a special ginger peeler. (I use both BTW). I got her a "butter boy" one year for helping to butter corn on the cob. This year, we gravitated to more "food stuff" items. I got her a special tea infusing travel mug and some of my favorite coconut green tea. She gave me a colorful set of Le Creuset ramekins (I love me some ramekins), and some deliciously wonderful spices from Oaktown Spice Shop. I'm excited to report that both are prominently featured in today's post! 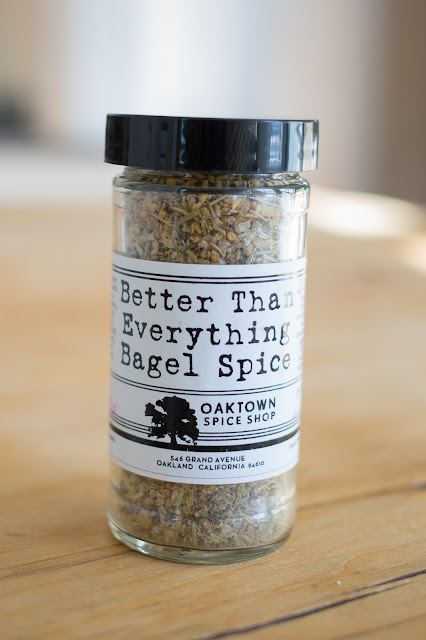 This "Better Than Everything Bagel" spice blend from Oaktown Spice Shop is da bomb. As the name suggests, it's better than an Everything Bagel blend because it has stuff like fennel and rosemary and smoked grey sea salt and Telicherry Black Peppercorns. Basically it's just flat out delicious and you should order some this very minute. But if you want to make this right away, I'd look for an Everything Bagel blend at your local spice shop or kitchen store (King Arthur Flour makes one), or make your own! (I include a suggestion for amounts in the recipe section). Since the Super Bowl is coming up this weekend, I decided this would make a perfect addition to a cream cheese-based dip to play off the bagel/breakfast theme. This would be awesome also as a schmear on an actual bagel, but I decided to make it into an easy dip served with bagel chips! I combined 8 ounces of cream cheese with 8 ounces of plain, 2% Greek yogurt (to make it more dip-y... is that a word? ), the spice, and some chives. Combine in a food processor until thoroughly mixed and refrigerate until you're ready to serve. See? So easy! I also decided to try making my own bagel chips, and these couldn't have been easier. I basically used the same technique I've used for tortilla chips in the past. Slice the bagel into super thin pieces, brush with a little olive oil, and sprinkle with whatever seasonings you desire. I suppose I could've doubled down on the bagel seasoning and used it here, but I instead used a little garlic powder and mixed that with the oil before brushing it on. Season with sea salt and bake at 325 until golden brown. I checked mine after about 10 minutes and continued baking them for about another 5. The thinner ones will crisp up faster than the others, so take those off if they brown up before the others. I used a whole wheat bagel to be kind of healthy-ish... (you know, because whole wheat bagels make a big difference when you're dunking them in cream cheese)... but choose whichever type of bagel you like best! When ready to serve, sprinkle with a little more bagel seasoning and snipped chives and serve with the bagel chips. This would make a great addition to your Super Bowl spread! (Bonus points for ramekins matching the two teams colors). Would also be great for a brunch appetizer, or, as I said... a schmear for actual bagels. And if this doesn't sound like your thing, but you'd still like to make a dip for the big game, I have plenty of other dip ideas on the blog... just search "dips" in the search feature in the top left hand corner of this page or in the recipe section of the blog. 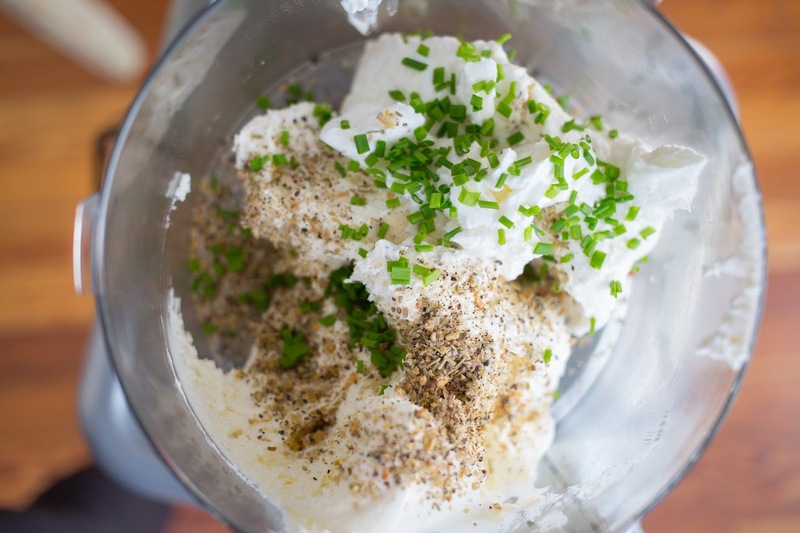 Place all ingredients in a food processor and mix until thoroughly combined. Refrigerate until ready to serve. 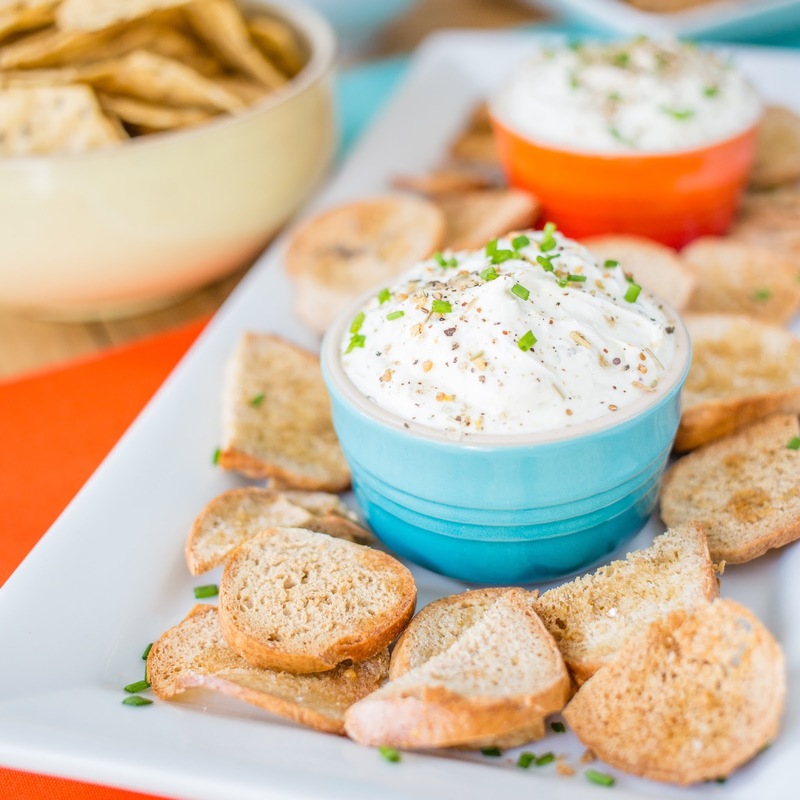 Sprinkle with more seasoning and chives and serve with bagel chips. Thinly slice the bagel into bite size rounds. 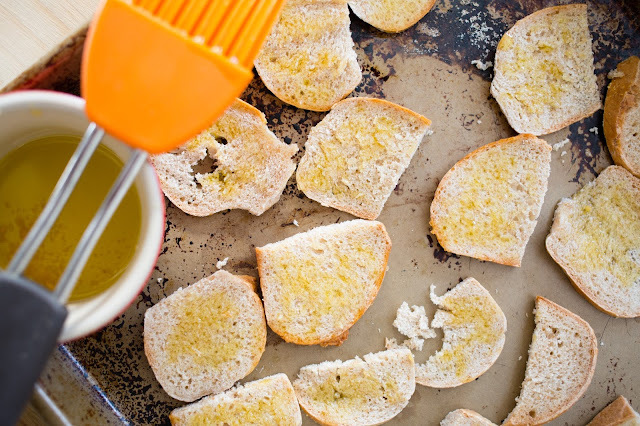 Mix together olive oil and garlic powder. Brush the rounds with the mixture and season with sea salt. Bake 10-15 minutes, checking after 10 and removing browned pieces as you go. Chips should be a nice golden brown. 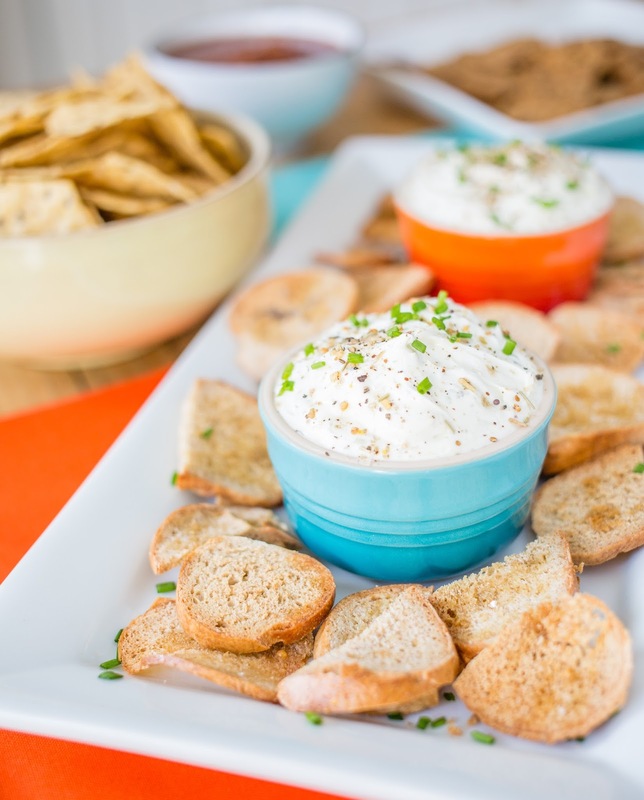 Serve with Everything Bagel Dip! Looks great!!! Will surely give it a try. Thank you!! Looks great!! Will surely give it a try, Thank you!!! I had made this twice and it was devoured by my family and guests, who all loved it.